Last week, Nails and I ventured out on a dreary, wet weeknight to a bar located on a rather abandoned block of downtown San Francisco. Much to my surprise, there was a line about 15 people long waiting to pay the $8 cover charge outside of the open doors. I'm not sure what I was expecting, but velvet ropes and bouncers were not included in any possible version of what our first time at Nerd Nite would entail. Nerd Nite is a monthly event popping up in cities all across the States, as well as Canada and Europe. 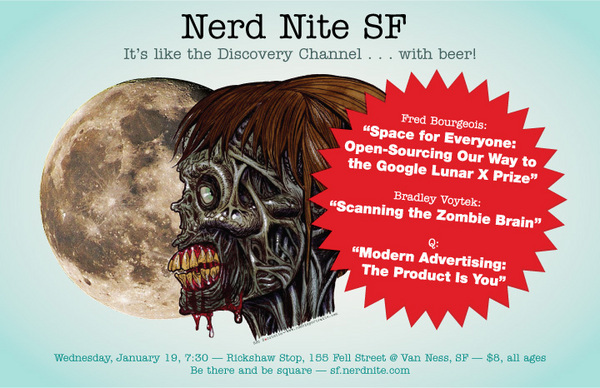 Their tag line accurately sums up the evening, "It's like the Discovery Channel but with beer." Each evening consists of a series of speakers on a variety of topics, giving humorous talks aided by PowerPoint presentations. (PowerPoint... at a bar. These are so MY people.) January's talks, for example, included a zombie brain discussion led by a neuroscientist. You can watch the video of Dr. Bradley Voytek's presentation on Vimeo. Presenters are either sought out by the Nerd Nite staff or are chosen by the team from proposals sent in by any interested parties. Last week's topics included a talk about the Real Estate crisis, San Francisco's historical vices uncovered at a local archeology dig, and a presentation given by the Bay Area's local roller derby team. While I was bored senseless by the real estate discourse, Nails thoroughly enjoyed it. Instead, I was thrilled learning about what the archeologists uncovered and enjoyed the peek at derby culture. 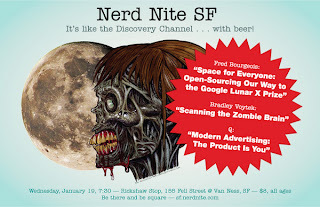 The MCs of Nerd Nite make a point of ensuring the event has a little something for everyone. The Rickshaw Stop itself was a nice venue. It's open and airy with clean bathrooms. (Don't scoff! That's important!) There was loads of seating, though the space is intended for music shows. The bouncer told me the audience was growing in size with each event. Last Wednesday, the place was packed with all sorts of enthusiastic nerds ranging in ages. It did my little geeky heart good to see the young woman sitting behind me plugging away at her MacBook. The drinks were fairly priced, my Stella (on tap!) was only $5. Nails' champunch, an odd concoction of champagne and some type of punch that combined to taste slightly of tuna maki but wasn't unpleasant, was $8. I can't wait for next month, though I won't be having the champunch.